Researchers at the UCLA Institute of Transportation Studies are currently recruiting participants for a study of the transit riding experience. This project asks participants to take pictures as they travel on public transit in the greater Los Angeles area. They will be able to create travelogues by uploading the photos to a website and adding written commentary. We will then analyze this information in order to better understand transit from the perspective of people using it. For more information about this project, please see the Frequently Asked Questions (FAQs) below. Do I need to ride transit regularly to participate in this project? No, we are looking for a range of participants – from people who use transit frequently to those who use it rarely or never. How many times do I need to ride transit? We would like participants to document four individual trip segments – in other words, two roundtrips or four one-way trips. You could also make one roundtrip and two one-way trips. What do you mean by a “trip”? 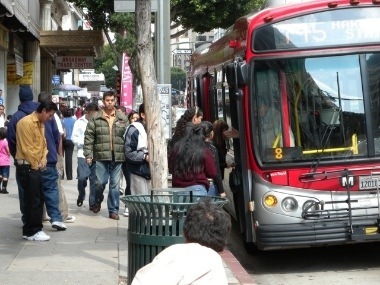 For this project, your trip on transit should be considered your door-to-door trip and not just your time on vehicles. Therefore, your trip may include travel to and from stops or stations, wait times, and, if you make one or more stops between your origin and destination, other activities that occur while you are not on a bus or train. What kinds of public transit routes should I pick for this project? Should I ride a route familiar to me? While taxis and shuttles technically are considered public transit, we would like you to focus on bus or rail routes for this project. You can pick any transit route on any system (Metro, Big Blue Bus, Culver CityBus, Long Beach Transit, etc.) in the greater Los Angeles area. You choose the starting and ending locations of your trip. You can ride a route that you know well or use often, or you can choose one you do not know. Or, you can make trips on a combination of familiar and unfamiliar routes. Please contact us if you have any questions about the routes you are considering. How many pictures should I take? We would like you to choose and upload at least 10 photographs per trip. You will be able to upload up to 25 photos. You might find it easier to take a number of pictures and later select a set that you believe capture your transit experience. What should I be using to take photos? You can collect your photos using a digital camera, a camera phone, or a smartphone. We anticipate that many people will use camera phones or smartphones for this project. What kinds of things should I be photographing? What you decide to photograph during your transit trip is up to you. You should consider that the final set of 10 to 25 photographs will represent your experience – both routine and unusual – on transit. The elements of a transit trip that are important to one person may be less so for another person. You might also find that different things are significant to you on different trips or even on various parts of the same trip. What should I bring with me other than my camera or cell phone? We recommend that you take some notes on your trips to help you remember important aspects of your journey. When you upload your set of photos, you can use these notes to add captions or longer descriptions about the photos (e.g., where you were located, what was happening, how you felt at that moment). In addition, we’ll ask you for information about your trip, including where and when your trip started and ended, the route number, the trip purpose, and whether you made any transfers or stops. You may find it helpful to write this information down while you are traveling. Is it okay to take pictures on transit? We all know that cell phones and digital cameras have become part of our daily existence. In particular, cell phones are commonplace in public places where people use them to talk, to take pictures, and to record videos. In many ways, we’ve become very desensitized to people using cell phones around us all the time. We do not anticipate your photo gathering activities for this project will be much different than what you likely do regularly with your cell phone or camera. However, we encourage you to avoid any situations where you feel uncomfortable or at risk, where your activities might make other people around you feel uncomfortable or at risk, or where there is direct confrontation or hostile behavior. Who are the researchers conducting this study? Camille N.Y. Fink (MA) and Brian D. Taylor (PhD) from the UCLA Department of Urban Planning are conducting this project with a grant from the University of California Transportation Center (UCTC). Please contact us at ucla.transit.photos@gmail.com if you have any questions. Should the rest of the country go for it? I think so. 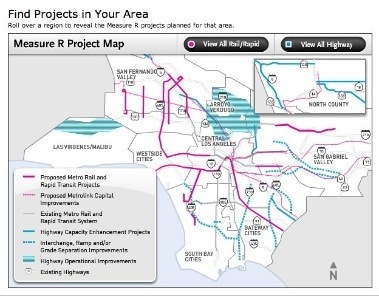 The major risks associated with the plan are cost overruns, which basically just mean LA will end up with less rail than envisioned, and that risk is always there with project development. This upfront financing probably lessens that risk. As an innovative financing tool, this may be one of the most important steps forward in funding regional transit services rather than relying on lukewarm federalist arguments that transit in LA is such a worthy good that senators from Iowa and Nebraska and North Dakota should want to see federal dollars going towards it. These types of local self-help financing tools, then, mean that the regional transit agency could tap into LA’s enormous tax base directly rather than having to deal with the crap-shoot of trying to get the feds to pay for local projects. There’s a lot to recommend this strategy both practically and theoretically.